We laid on 200mm wide tapes cut from the same 10 oz biaxial fibreglass as the boat is skinned with, then sanded off the rough edges and spikes. Next we primed the wooden skin where the Kevlar was to be, and pre cut the fibreglass and Kevlar cloths ready to drape on and saturate with epoxy. It’s been a while since I posted an update on Charlie’s progress. Lots of magazine article writing and plan drawing, running around finding stuff and some teaching with the Massey University School of Design teaching a group of great young people the basics of boat design not to mention monitoring the build of a really interesting 40 ft power trimaran. We did the big sticky job - that’s skinning the boat with Kevlar and fibreglass, 10oz in both cases, quite thick and certainly a huge contributor to the boats resistance to puncture. 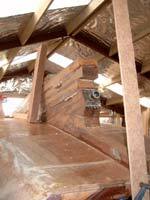 That’s what the Kevlar is for, we covered the area from midships to the bow from the fender wale just below the gunwale down to the lower chine. Its not easy stuff to handle, it is difficult to cut, does not change colour a lot when wet out and pretty much impossible to sand smooth if you get a bubble in it. 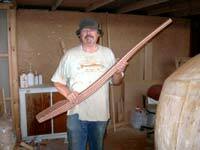 Thanks to boatbuilder Hugh Miller for giving us a hand. Much appreciated. That difficulty in sanding is also the reason why we put the Kevlar under the glass, that allows us to sand, fill and fair the surface without getting into trouble. With the fibreglass on and wetted out you can see the Kevlar crash mat between the 'glass and the wooden skin. The Kevlar covers the area most likely to be damaged if the boat hits a floating object, whether a container, a dead tree or ice. The intention is that although Kevlar does not add greatly to the strength, it's very hard to puncture and will greatly reduce the inflow of water; improving the chances of effective damage control should Resolution hit something hard. After squeegeeing the Kevlar on, we put the 10 oz biaxial fibreglass cloth from side to side and ran the resin in wet on wet over the yellow Kevlar, we got both lots of Kevlar and two 50inch wide strips of glass on that day. Next day saw two more strips of glass, and the third day saw us finished with that part. It took a while mainly due to needing to get the resin beginning its curing reaction before the temperature dropped, as it was it stayed slightly chewy for about 48 hours but went off ok in the end. Its winter here and we were just getting the first of the seasonal frosts so it paid to be careful. Besides, by about 3pm we’d had enough of that game for the day. 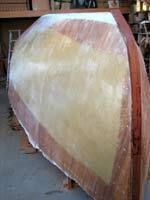 After sanding the worst of the bumps off and filling the major hollows Charlie then put a mix of West 410 microlite and resin on with a roller, two coats to build up a film that would allow him to sand her fair without getting back to the fibreglass cloth. Then started the hard stuff, I made up a couple of longboards, 100mm wide and about 700mm long, slightly springy with 80 grit sandpaper. I’d say that our hero has much larger shoulders than he had when he began! My old Bosch PEX 125 random orbital sander did sterling service, but between the hand sanding and machine sanding plus filling and fairing it took quite a few days, but she will look lovely when painted. Getting a nice even finish on the fibreglass takes a lot of work. I am sure that Charlie's shoulders grew noticeable with the work that he put in over a couple of weeks. 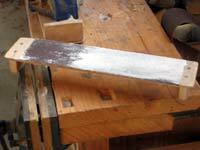 This is a short 'longboard" with 60 grit commercial sandpaper contact glued to it. It sands the tops off the bumps and leaves the hollows showing clearly so they can be filled. We used West Resin with 410 Microlite mixed in and applied with a roller, then spot filling with a steel putty knife. After that was over, a capping of five layers of 6mm hardwood was laminated around the stem, leaving a small projection which will tie into the keel, this has been bevelled and forms the cutwater and the flat for the bobstay fitting. Its starting to look rather smart up on that end of the boat, not like the after end where we wont be fitting the transom until very near the last. Why? Imagine this little monster sitting in her cradle while the interior and cabin are completed, its over six feet up from ground level to the gunwale, and every time you want in or out it's climb up and down all that way. Easier to put a ramp up through the open transom. Next up was the keel, now that’s complex stuff, the propshaft tube had to be fitted, absolutely accurately positioned in both axes and then the keel built around it. I had Charlie make a template of the after end of the keel, drawn full sized from the scaled up plans he propped it up and measured off the angles and length of the propshaft tube, and we split a length of 80mm x 160mm Kwila and used the table saw to hog a semicircular groove lengthwise down each half. Next job was to build the section of the keel between the boats bottom and the propshaft leaving the angled shaft tunnel piece at the right angle, then scribe and cut the tunnel piece. With the glass on, it's the keel next. Great big lumps of 150mm x 70 mm Kwila. This stuff is HEAVY! There will be about 300 kg of it in the keel structure, plus of course the 720 kg of the lead casting! Here is a view of the area around the propshaft and propellor aperture. There is a lot of shaping to go as yet and although we use an angle grinder with coarse sandpaper to sculpt softwood, it just makes clouds of smoke on this very dense wood so we are looking for a tungsten carbide tipped wood carving disc to complete the job. We had to pull the boat forward about a metre to get the stern out from under the mezzanine, not hard to do but boy that building frame was well bolted down, it took two attempts before we had it free but then a good pull with the old Toyota and she moved, only about a foot too far, and with a car jack and a couple of levers we heaved her back into the right spot. Shes moved her first, and seemed very willing. A good omen perhaps. C. T. W. now has a large amount of the keel built, slinging the big baulks of dense hardwood around as though he’s done it all before. I note a considerable improvement in his self confidence as the project goes along. I was aware that the prospect of build the keel bothered him a bit, especially the area around the prop and shaft, but he’s smiling and getting on with the job really well now. I have bought a couple of new bandsaw blades today, one is 8 teeth per inch and about ½ inch wide, and one three teeth per inch and 5/8 wide, the latter for deep cutting of hardwood. My bandsaw is a 2 ½ hp model, heavier by far than most handyman machines and its only just coping with the big lumps of this very tough timber. I hear the 10 inch Makita skilsaw going at it with a will, and the little Bosch power plane. This from a man who was quite tentative with power tools not so long ago. Good stuff, he’s getting more organised and more productive as his confidence grows. I need to buy a power carving tool the kind with tungsten tips that goes on an angle grinder and is used for rapid removal of material, the 36 grit sandpaper that we use on the softwood just makes clouds of smoke on the kwila, anyone know of a New Zealand company that stocks them? I need one about 90 or 100mm with some spare tips. Charlie will have this in his hand for a lot of hours, the tiller is laminated from layers of lovely rich red Jarrah hardwood and pale honey coloured Fiji Kauri. It has a nice, reassuringly solid feeling about it and looks stunning. While the glue has been setting up on each stage of the keel, its huge joints held down by some big 20 kg quarried paving stones and lag screws (carriage bolts in some parts of the world) he’s pitched into building the rudder. That’s a big lump in itself, about 6 ft high and 22 inches wide at its widest, laminated from 40 x 40 mm (1 5/8in) strips with the first four being in Jarrah hardwood and the rest being Fijiian kauri, glued and through bolted. 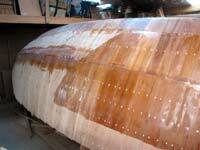 We are waiting for a very long drill but sections of the rudder are all glued up. I’ve been getting on with the drawings, made a list of keelbolts (coming from Port Townsend Foundry up on Puget Sound, thanks Pete and Cathy) and am building more shelving for my as yet incompletely fitted out workshop, I need to get more of my stuff off the floor so we have moving around space and a set of shelves for all the treasures Charlie is buying on Ebay and TradeMe. It gets like Christmas sometimes with all the parcels coming in and we need to keep them all together so he knows what he’s got. We now get regular visitors coming to look, and although many have concerns about the trip when they hear about the small boat and the length of the planned voyage those who have come and seen the real thing are smiling when they head off down the driveway. That includes a professional ship surveyor who’s training was in wooden fishing vessels, and that was really reassuring.